Please join us on Saturday, December 9 at 6:00p.m. in the school cafeteria. 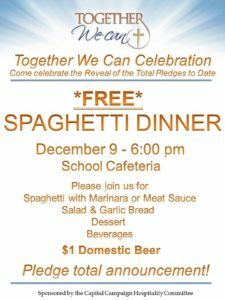 We will gather as one church family as the pledge total for the Together We Can Campaign is announced. A spaghetti dinner will be served. Join us as we celebrate our parish community, and the overwhelming generosity that has been displayed by so many. Online ticket sales begin at noon, Monday, Nov. 20 for a three-hour retreat for married couples entitled “Our Marriage Is Our Treasure,” which will happen from 9 a.m. to noon, Saturday, Feb. 10, 2018, in Schindler Hall, St. Patrick Church, 1000 N. Beckley Station Road, Louisville. [This retreat is cosponsored by St. Aloysius and five other churches.] This retreat is limited to the first 100 couples [or 200 individuals] who buy tickets. The link to the payment page will be at the Epiphany website cover page by noon, Monday, Nov. 20. Tickets are $15 per person, $30 per couple. and marriage enrichment programs at the parish and diocesan level for most of their married life. They are authors of Joined By Grace, a new marriage preparation curriculum by Ave Maria Press. in celebrating their love for each other and reflecting on the gift and blessing that is their marriage. This retreat is expected to sell out quickly.